With all the celebrities passing recently, I thought I would identify a great mind that has also been silenced. 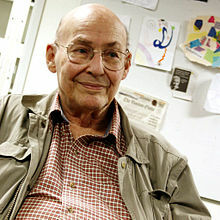 Marvin Minsky was a philosopher/mathematician/Computer Science educator at M.I.T., where he co-founded their Artificial Intelligence lab. He made many strides in the fields of computer science, artificial intelligence, cognitive science, and the mind. Minsky was also an atheist. Here is the New York Times article about his death, and here is his Wikipedia page. Both are worthwhile reads. This entry was posted in News, Science and tagged News, Science.